Ed. Kristi Siegel. New York: Peter Lang Publishing, 2004, ISBN: 978-0-8204-4905-0, 320 pages. $32.95. Contact Peter Lang Publishing at www.peterlang.com, or order through Barnes & Noble - website or Amazon - website. Women experience and portray travel differently; gender matters—irreducibly and complexly. Building on recent scholarship in women’s travel writing, these provocative essays affirm the impact of gender, but also cast women’s journeys against coordinates such as race, class, culture, religion, economics, politics, and history. The book’s scope is unique: women travelers range in time from Victorian memsahibs to contemporary “Road girls,” the topics presented are as diverse as Anna Leonowens’s slanted portrayal of Siam—later popularized in the movie, The King and I—and the rhetoric of peril long associated with women’s travel. The extensive array of writers examined includes Frances Trollope, Cameron Tuttle, Lady Mary Montagu, Catherine Oddie, Kate Karko, Nancy Prince , Frances Calderón de la Barca, Rosamond Lawrence, Zilpha Elaw, Alexandra David-Néel, Amelia Edwards, Erica Lopez, Paule Marshall, Bharati Mukherjee, and Marilynne Robinson. “The contributors to this book are well aware of the complexity of gender and the way that gender operates in different ways in different contexts. The women travellers considered here do not have much in common, since they are divided by historical period, privilege, class, race and wealth, but it is perhaps the diversity of the women represented here which is the book's greatest strength, because although the women do not write in the same way as each other, gender nevertheless manifests itself clearly and makes its presence felt. In this way we are able to see the way that gender operates in particular contexts. 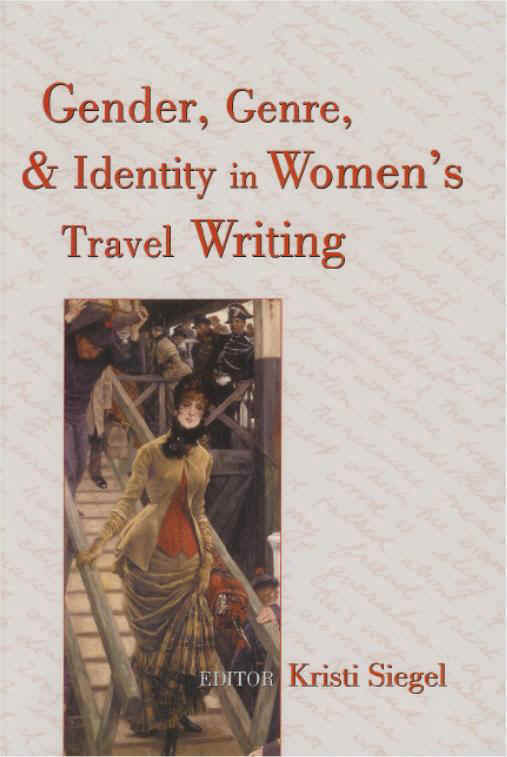 This book enables us to move away from assuming that women travellers write in a particular way or in a particular style, with certain themes predominating and towards a type of contextualised analysis which is subtle enough to unpick the intricacies of the way gender operates." Identity in Rosamond Lawrence's Indian Embers: "I Cannot Somehow Find Myself"
KRISTI SIEGEL is Associate Professor and Chair of English (and the Languages, Literature, and Communication Division) at Mount Mary College in Wisconsin; she earned her Ph.D. in Modern Studies from the University of Wisconsin-Milwaukee. She is the author of Women's Autobiographies, Culture, Feminism (Peter Lang, 2001), and editor of a collection of essays about travel writing, Issues in Travel Writing: Empire, Spectacle, and Displacement (Peter Lang, 2002). She also serves as general editor for the book series Travel Writing Across the Disciplines (Peter Lang), and has published various articles on postmodern, feminist, cultural, and autobiographical theory.